Nerdy Nibbles is back and we’re celebrating Spring all month long! Even though it doesn’t quite feel very Spring-ish here in the south just yet. 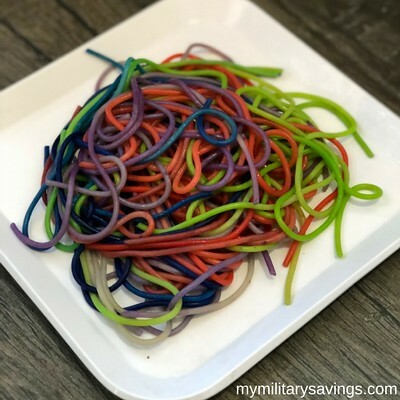 I love all things bright and rainbow so I decided to test out the rainbow spaghetti that’s making it’s way around the internet lately. Guess what? It’s SO easy! 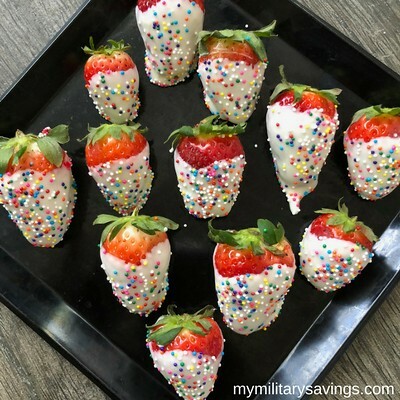 Plus, to go with our rainbow pasta, the kids and I made white chocolate dipped strawberries with rainbow sprinkles. YUM! 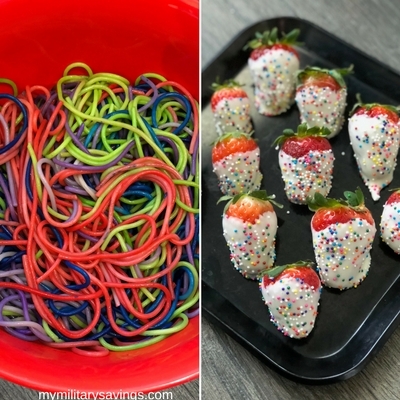 These two recipes are super quick and easy and such a FUN way to celebrate Spring! Check them out! I started with making the strawberries since the chocolate will need to harden. It’s pretty self explanatory and really easy, but I’ll run through what I did. 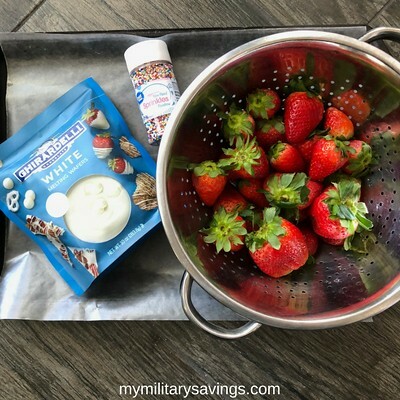 All you need is clean strawberries, rainbow sprinkles, and white chocolate. You can use milk chocolate or dark chocolate, but I really wanted the rainbow sprinkles to be seen! Melt the chocolate chips into a microwave safe bowl, according to the package instructions. 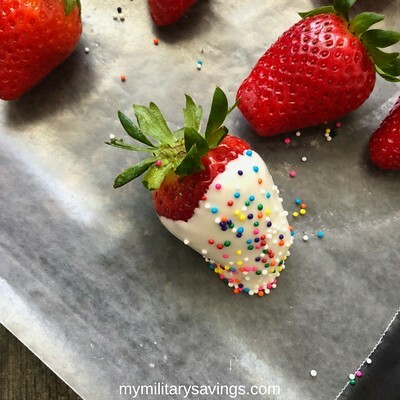 Dip each strawberry into the chocolate and place on a sheet of wax paper. Immediately decorate with sprinkles while the chocolate is still soft. Repeat this process on all the strawberries! I love how the white chocolate hardens with the sprinkles to give a nice yummy crunch before you hit the juicy strawberry. These make GREAT desserts or after school snacks! While your strawberries set, go ahead and boil your spaghetti noodles. I used a 16 oz box, but this recipe is very easy to cut in half or even double to make a big batch! You’ll need food coloring of your choice (I used 4 different colors) and plastic storage bags to help mix the color and contain the mess. So easy! I placed the first bag in a bowl to make it easier to maneuver. 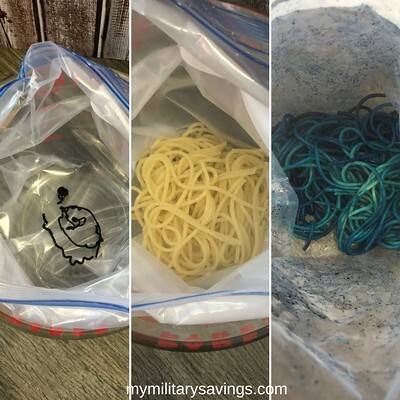 Squirt a teaspoon or so of food coloring into the bag, add 1/4 of the cooked pasta, close the top and mix it up with your hands! If the pasta is too hot to handle, use an oven mitt. This is a great step for the kids to help with! So easy! Repeat the process with the other colorings. 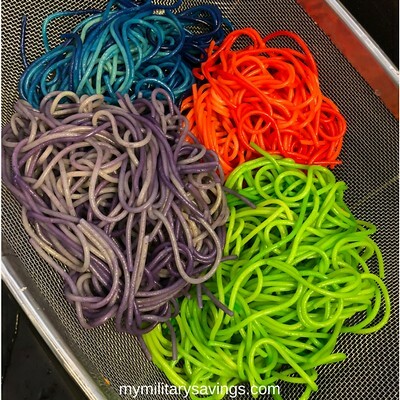 I quickly rinsed the colored pasta in a strainer just in case there was food dye that wasn’t absorbed. It’s not a necessary step, but my boys are already messy and they don’t need any added help in that department! Ha! 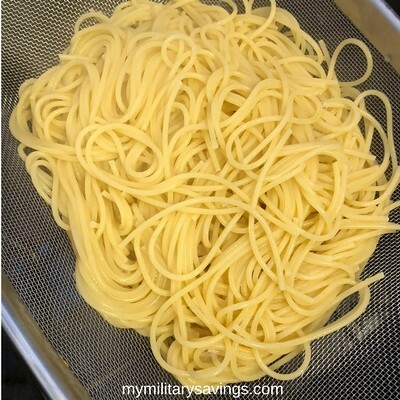 This pasta is great for kids (like mine!) who love plain spaghetti noodles. A quick drizzle of olive oil and a sprinkle of salt and the boys were in rainbow heaven! You could also make all green pasta for St. Patty’s Day! This is a great dinner to get the kids involved in and it was so easy to whip up! Why not have a little fun with your food? 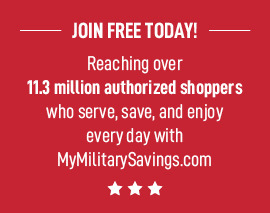 For more great recipes, head on over to mymilitarysavings.com. Membership is free so sign up today!